"He soon perceived, however, that the battles which Sir Miles and the rest had waged against armed knights to win a kingdom, were not half so arduous as this which he now undertook to win immortality against the English language. Anyone moderately familiar with the rigours of composition will not need to be told the story in detail; how he wrote and it seemed good; read and it seemed vile; corrected and tore up; cut out; put in; was in ecstasy; in despair; had his good nights and bad mornings; snatched at ideas and lost them; saw his book plain before him and it vanished; acted his people's parts as he ate; mouthed them as he walked; now cried; now laughed; vacillated between this style and that; now preferred the heroic and pompous; next the plain and simple; now the vales of Tempe; then the fields of Kent or Cornwall; and could not decide whether he was the divinest genius or the greatest fool in the world." Woolf, Virginia. Orlando. 1928. 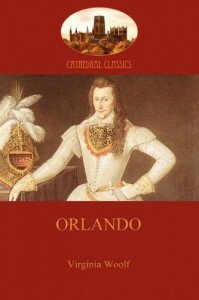 Cathedral Classics edition, 2010. Aziloth Press: London.